Metastasis of distant tumors to oral cavity is very uncommon. Nearly, 90% of metastatic tumors occur in jaw bones, especially premolar-molar region of the mandible, whereas metastases to soft tissues are extraordinarily rare and account for 0.1% of all oral malignancies. Most metastatic tumors to the orofacial region are seen in patients aged between 40 and 70 years. Metastasis to the soft tissues mostly involves gingiva and alveolar mucosal sites (54%) followed by tongue (30%)., In some cases, oral metastatic tumors are found to be the first sign of metastatic spread and in some instances; they are an indication for unidentified primary tumor of the distant site. Common sources of metastasis to the oral region are breast, lung and kidney. The primary site differs according to oral site colonization. In men, primary tumor of the lung followed by the prostate gland and kidney commonly affects both the jawbones and oral mucosa. In women, the breast is the most common primary tumor site affecting the jawbones and soft tissues (41% and 24.3%, respectively), followed by the adrenal and female genital organs. Clinically, these metastatic lesions appear nonaggressive, mimicking reactive or benign lesions or even simple odontogenic infections. The clinical features of these lesions include a bony swelling with tenderness, pain, ulcer, hemorrhage, paresthesia and pathological fracture. Sometimes, tooth mobility and trismus are also present. It is important to diagnose the origin of the tumor as the management will depend significantly on the histological type. Although infrequent, oral metastases are rarely encountered as the first sign of occult cancer. Hence, this article emphasizes on detailed dentoalveolar examination and early diagnosis for finding the primary focus of metastatic tumor. 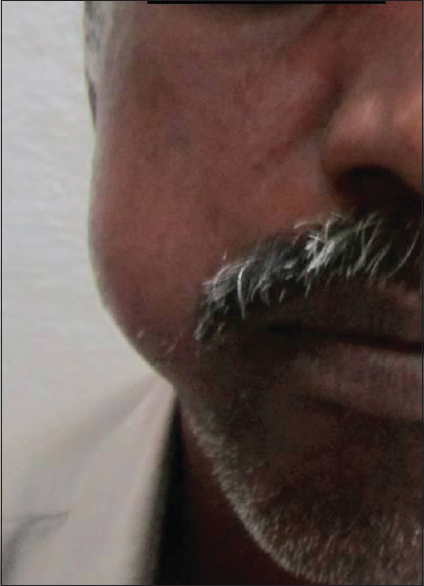 A 60-year-old male patient presented with a swelling in the right lower back teeth region of the jaw since 3 months [Figure 1]. The patient complaints of pain for 10 days, radiating to the right temporal region. The patient was a known hypertensive since 4 years. On extraoral examination, a well-defined, solitary swelling measuring 4 cm × 5 cm was noted on the right side of the mandible, which was hard in consistency and fixed to the underlying skin. Right submandibular lymph nodes were palpable and nontender. No other pathologic findings were noticed during physical examination. On intraoral examination, firm, nontender swelling with ill-defined borders measuring 3 cm × 3 cm was noted in the right mandibular premolar-molar region [Figure 2]. Patient was partially edentulous with poor oral hygiene. There was no ulceration, paresthesia or pathological fracture. Patient was advised for oral pantamograph and computed tomography (CT) scan. Serial axial sections of the neck were obtained with and without intravenous contrast. 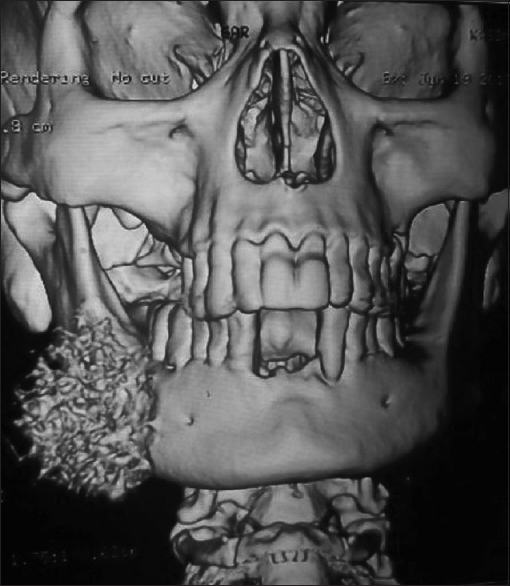 CT scan of the face with three-dimension reconstruction revealed a well-defined osteolytic lesion involving the ramus and body of the right half of the mandible, measuring 54 mm × 45 mm × 50 mm (anterioposterior × Transverse × craniocaudal). It showed speculated periosteal lesion with multiple irregular calcifications and extended into the lingual and mandibular soft tissues [Figure 3]. Based on the clinical presentation, a differential diagnosis of inflammatory swelling, odontogenic cyst, odontogenic tumor, soft tissue tumor or metastatic tumor to the jawbones was given. Incisional biopsy was done for the histopathological diagnosis. Histopathological examination of the H and E stained tissue showed diffuse fibrous connective tissue stroma invaded by the tumor cells which were cuboidal to short columnar with eosinophilic cytoplasm arranged in alveolar/follicular pattern of varying sizes [Figure 4]. Micropapillary projections were seen from the peripheral cells in the follicle. Bony trabeculae were evident in some areas [Figure 5]. 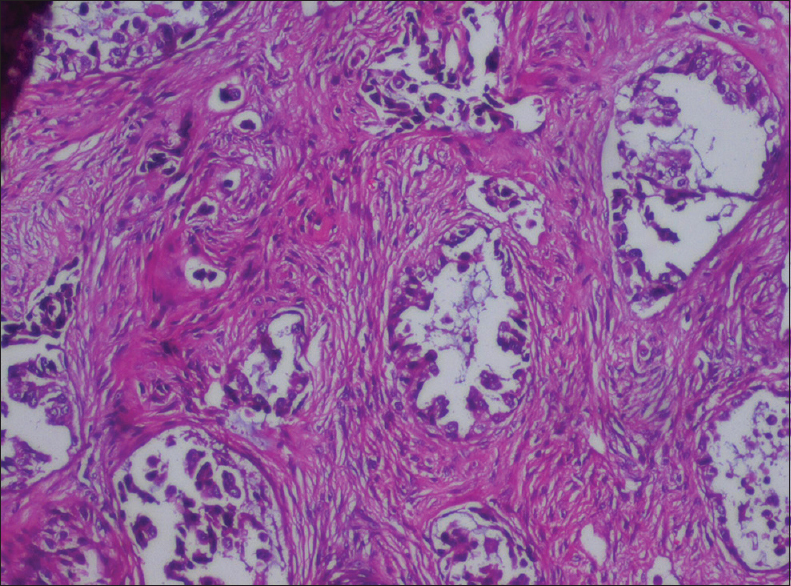 Based on these features, the lesion was diagnosed as a metastatic malignant tumor, probably metastasizing from the lung. Hence, the patient was advised for chest radiograph and CT scan. X-ray chest posterior-anterior view revealed consolidation of the right lower zone [Figure 6]. The CT scan of the chest with contrast revealed dense soft tissue mass lesion with speculated margins and focal pleural thickening noted at the right posterior basal segment. Later lung biopsy was planned at a higher center. Ultrasound scan of abdomen and pelvis was done and no abnormality was detected. No other metastasis was detected. Treatment for the patient was palliative external beam radiotherapy on LINAC given to a total dose of 3000 cGy in 10 fractions to jaw by RL/LL for 12 days which was well-tolerated by the patient. Chemotherapy included injection cisplatin (75 mg)-intravenous (IV); injection etoposide (150 mg)-IV; tablet vomiset (8 mg); tablet ultracet. Metastasis is a biological basis by which tumor cells breach a sequence of barriers. Carcinomas are the most common type of metastatic cancer to the mouth and jaws. The common primary sources of tumors metastatic to the oral region are the breast, lung and kidney. The actual incidence of these cancers is unknown since oral metastatic disease is usually a manifestation of advanced disease. The mean age of occurrence is 54 years with slight male predilection. In our case, also the patient was aged about the same age (60 years) as supported in the literature. Most of the patients are aware of primary tumors before the metastatic spread to the oral cavity. 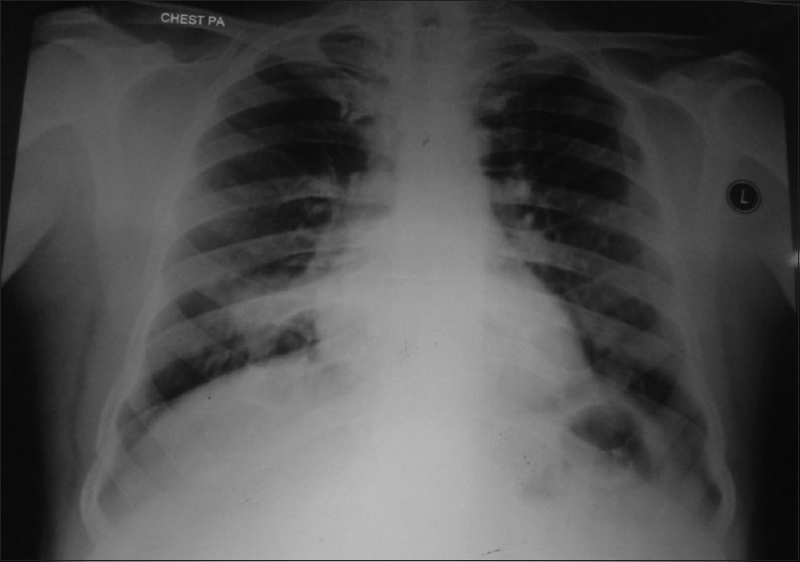 In our case, the patient was asymptomatic and was unaware of lung cancer. The most common primary sites for oral metastases were the lung, kidney, liver and prostate for men; breast, female genital organs, kidney, and colorectum for women. In our case too, lung was found to be the primary site. The clinical presentation of the metastatic lesions differed between the various oral sites. In the jawbones, most of the patients complain of rapidly progressing swelling, pain, paresthesia, difficulty in chewing, dysphagia, disfigurement and bleeding., Our patient presented with features such as firm, nontender swelling with ill-defined borders. There was no paresthesia, difficulty in chewing, dysphagia, bleeding and pathological fracture. Pathogenesis of oral metastasis is unclear but thought to be a multistage process in which cells detach themselves from the primary tumor and get transported by lymphatic or blood vessels. Recent studies state that cancer cells metastasizing to bone have shown to alter the physiologic balance between both bone resorption and bone formation. Treatment of oral metastasis depends upon its presentation and the stage during which it has been identified. Unfortunately, the identification of a metastatic tumor usually represents a poor overall prognosis. Management includes chemotherapy, radiotherapy, surgical excision or a combination of the techniques under local anesthesia. Oral metastases usually are evidence of a widespread disease and indicate a grave prognosis. An average survival time for lung cancer metastasis is 4 months to 1 year with a maximum survival rate of 5 years. Akheel M, Tomar SS, Hussain SM. Metastatic oral soft-tissue lesions: An incidental finding in four cases. South Asian J Cancer 2013;2:146. Hirshberg A, Shnaiderman-Shapiro A, Kaplan I, Berger R. Metastatic tumours to the oral cavity – pathogenesis and analysis of 673 cases. Oral Oncol 2008;44:743-52. Orlandi A, Basso M, Di Salvatore M, Federico F, Cassano A, Barone C. Lung adenocarcinoma presenting as a solitary gingival metastasis: A case report. J Med Case Rep 2011;5:202. Ravi Prakash SM, Verma S, Gill N, Malik V. Multiple gingival metastasis of adenocarcinoma of the lung. Indian J Dent Res 2012;23:558-9. Misir AF, Mercan U, Günhan O. Metastasis of lung adenocarcinoma to the mandible: Report of a case. J Oral Maxillofac Pathol 2013;17:253-6. Kumar G, Manjunatha B. Metastatic tumors to the jaws and oral cavity. J Oral Maxillofac Pathol 2013;17:71-5. Yousra A, Samia A, Mohammed EI. 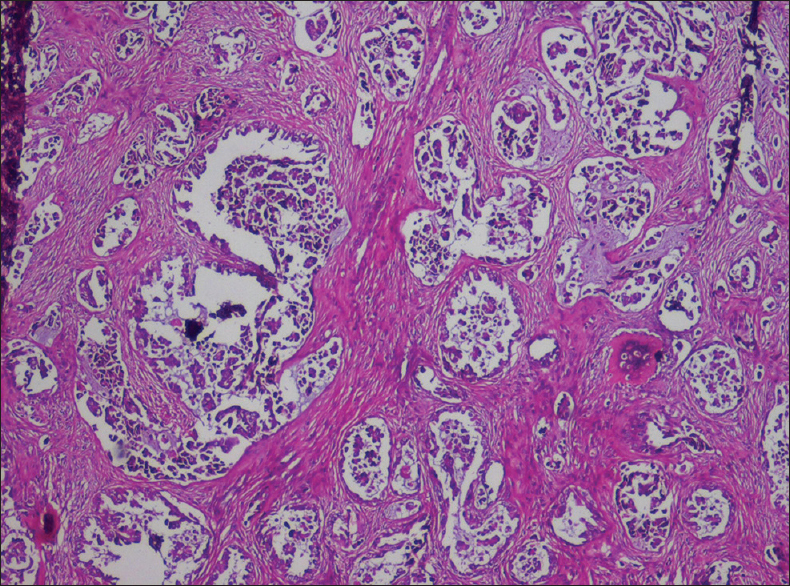 Soft-tissue metastasis revealing a pancreatic adenocarcinoma. One case report and a review of literature. Pan Afr Med J 2012;11:1-5. Daley T, Darling MR. Metastases to the mouth and jaws: A contemporary Canadian experience. J Can Dent Assoc 2010;76:1-7. Curien R, Moizan H, Gerard E. Gingival metastasis of a bronchogenic adenocarcinoma: Report of a case. Oral Surg Oral Med Oral Pathol Oral Radiol Endod 2007;104:e25-8. Seoane J, Van der Waal I, Van der Waal RI, Cameselle-Teijeiro J, Antón I, Tardio A, et al. Metastatic tumours to the oral cavity: A survival study with a special focus on gingival metastases. J Clin Periodontol 2009;36:488-92. 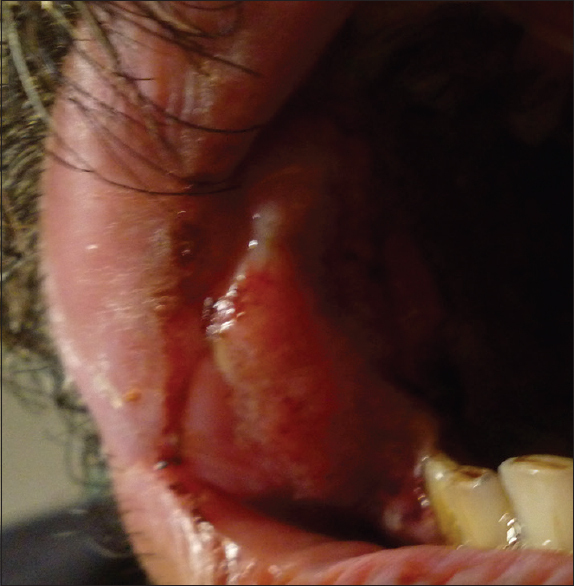 Moharil RB, Khandekar S, Dive A. Metastatic lung malignancy to mandibular gingiva. Indian J Dent Res 2010;21:449-51. Alaa MS, Emre B, Begüm K, Yetisyigi T. Metastasis from lung cancer. Presenting as pyogenic granuloma in the lower gingiva. Acta Stomatol Croat 2012;46:307-11. Panagiota P, Ioulia C, Evaggelia P, Nikolaos P. Metastatic lung adenocarcinoma to the mandibular gingival. Case report and review of the literature. Hell Arch Oral Maxillofac Surg 2012;1:55-61. López-Jornet P, Garcia G, Camacho-Alonso F. Isolated gingival metastasis from lung carcinoma. N Y State Dent J 2011;77:27-8.